Some people live for quantity, take Wal-mart for example. 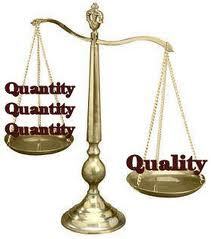 More and more people want more bang for their buck, but as a result quality is suffering. You know how women open their bulging closets and whinge that they have nothing to wear? That's because they have quality vs. quantity issues. I did the same thing. Now I've got a few clothes, but they're good quality. They were more than I paid for clothes before, but I wore them more and felt good in them. I also got more bang for my buck. So before I'd spend, let's see $25 on a top and wear it twice a season, making the cost per wear $12.5. Now I'd spend $50 on a top, but wear it at least 10 times per season, making the cost per wear $5. I promist that this has to do with TEFL. Now I'm not saying that more expensive items are better quality. Cheaply priced items can be good quality and expensive items can be of crappy quality. Many times items are more expensive because they have higher advertising costs, like luxury brand items (Prada, Burberry, etc). So how does this relate to TEFL? Time in class: Simple, schools tend to go for quantity rather than quality. Take classes for example, you have to teach for X number of minutes. Sometimes teachers finish early but aren't allowed to let their students go because the class time isn't up. So what do they do? They use fillers. The name alone should tell you that often their only purpose it to fill up time (Hangman anyone?). Books: Another example is finishing the book. Students might have to work too slowly or rush through a chapter simply so that it can be checked off the list. The admin isn't too concerned about the results so long as they finish what's on the syllabus. Teachers' salaries: How about costs? That's pretty simple. Schools often want to pay a teacher as little as they possibly can. Lesson quality can suffer because of that. Teachers can suffer as well since they get into pricing wars. Well-qualified teachers are having to take pay cuts simply because schools aren't willing to pay them what they're worth. Schools know this and offer pitiful salaries which teachers are forced to accept if they want to work at all. Schools need to focus on quality. Plain and simple. If students finish a lesson early, they should be able to go home. If they take a bit longer to understand the concepts, then the syllabus should change. And finally, schools should stop paying teachers slave wages.